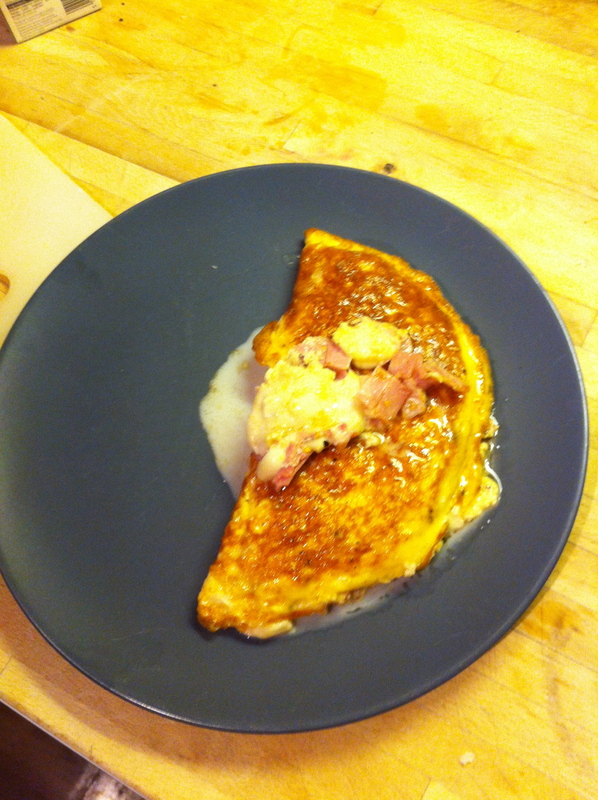 Cooking in 2012 – March: Omelette. I know, I know, so technically it is April. But after the traumatic making of the lasagne in February, I needed a great deal of recovery time! And I will attempt to catch up and do another dish this month to bring me back on track. I must first and foremost give thanks to Starbucks (mi amor cafeinado!) for providing me with the app that made the omelette possible: How to Cook Everything. Since I cannot cook anything (by this point you should be well aware that I am not exaggerating), when I saw this app available as the free download of the week instore, I had to get it. You search for what you want to make, it comes up with a list of ingredients you need, a step-by-step recipe, and away you go! Om nom nom. Add some salad or some bread on the side, and away you go! Although it wasn’t up to the standard of Balan’s (but then, little is), it was pretty tasty, quick and easy. Just how I like my cooking to be! Plus, it wasn’t too expensive, and I didn’t end up left over with loads of ingredients that would ultimately end up in the bin. Although part of me feels I should learn to make scrambled eggs with the remaining eggs. Seriously, they should sell eggs in packs of 2 or 4 (if not singly). But after February’s severe erosion of my confidence and patience, I am feeling a bit stronger and more satisfied with myself – this was a good success under my belt. Toby helped me, as usual, but this time I did not lose my temper and I don’t think I made him bang his head against the wall! Progress! Hello! So as discussed in my last post, I have been contemplating creating a little photojournal of my travels in London. And by taking pictures of every tube station, I hope to expand my own travels and really get to know the city! As you might expect, I will start off with the tube stations I see most often. 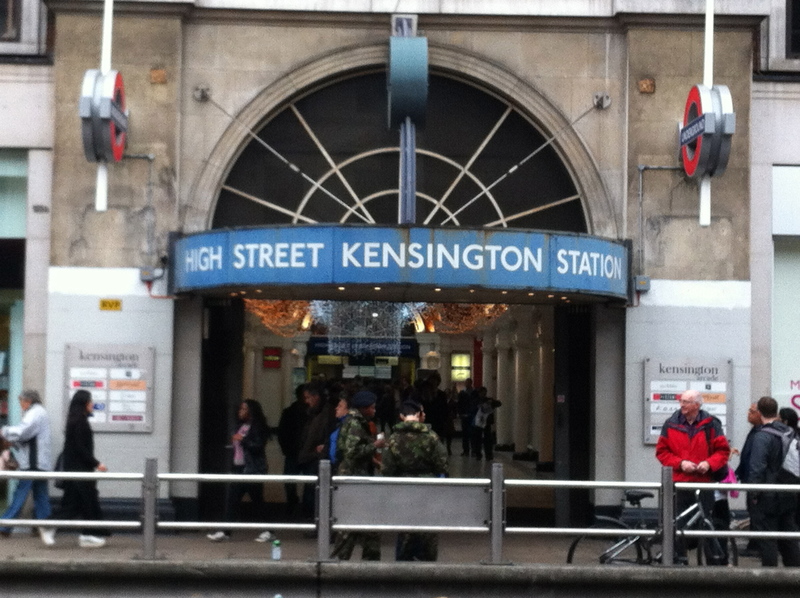 Although I live close to Earls Court, and I am sure that soon I will have a picture of that one to add to my collection, I am going to start off with High Street Kensington. I walk past this station (or more often, pass it on the bus) every day to and from work, and it’s a nice venue for shopping – as me and Toby did today. Moreover, it has a Waterstones and a Balans (where Toby and I had a yummy lunch), which delights me. There’s also a TKMaxx with some very good fragrance and body product deals, as well as a nice selection of clothes (some of which I might add to my collection once I have more money). Music-wise, there is a Piano bar I wish to visit, and offices for Universal Music and Warner Music. The excitement of living in the capital!